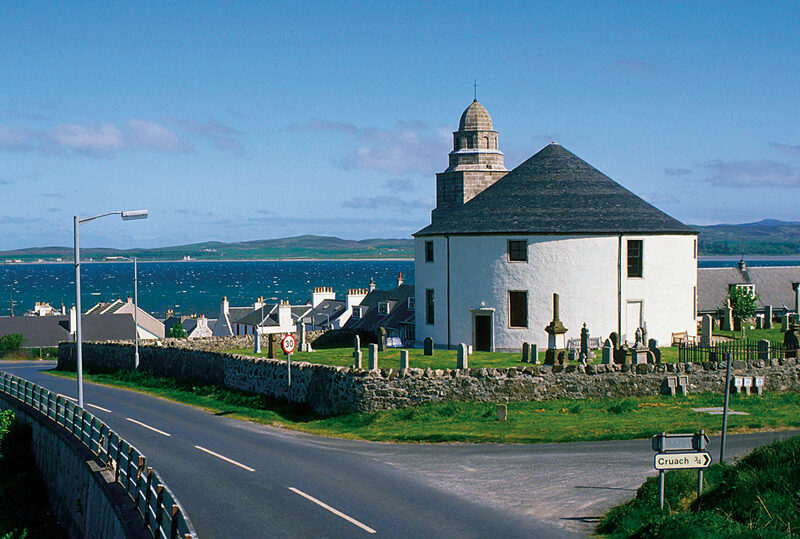 The view of Port Ellen from the south coast of Islay. Photo by P. Tomkins courtesy of VisitScotland/Scottish Viewpoint. A harbour view on the Isle of Jura. Photo by Katie Nanton. The distinct round church of Bowmore on Islay. Photo by P. Tomkins courtesy of VisitScotland/Scottish Viewpoint. Barnhill, where George Orwell finished writing 1984. Photo by Katie Nanton. 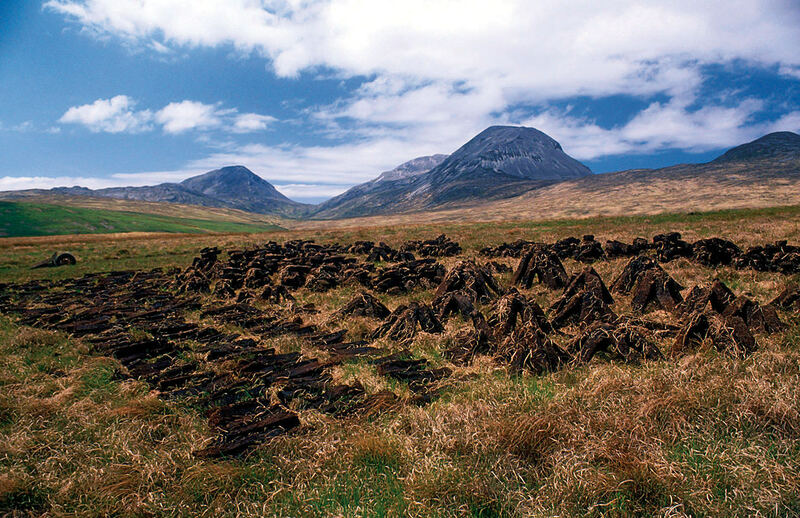 Stacks of cut peat on the island of Jura. Photo by P. Tomkins courtesy of VisitScotland/Scottish Viewpoint. Among the first features you’ll encounter upon entering Glasgow’s Kelvingrove Art Gallery and Museum—Scotland’s most-visited free attraction—are a stuffed elephant and an exhibit on Scotland’s geese on the museum’s ground level. But eventually, after sufficient searching, you can ascend a flight of stairs, take a left turn, and uncover a dark corner, where more careful attention will reveal a curtained room and, finally, a painting within: Christ of Saint John of the Cross by Salvador Dalí. The oil painting, which depicts Christ’s crucifixion as seen from above the cross, was acquired by Glasgow in 1952 and displayed at Kelvingrove. (The city paid £8,200 for the artwork, and the Spanish government is said to have offered £80 million for the painting decades later, but was turned down.) It was met with both admiration and criticism; some fumed that it looked down upon Christ when the viewer should, instead, be looking up in admiration. The piece is thrilling to see, but even better to come across without previously knowing that it exists in Kelvingrove. This is precisely how I discover this Spanish masterpiece in the heart of Scotland. All but hidden from view, Dalí’s canvas is the jewel in the gallery’s crown. Just as famous paintings rarely greet visitors at gallery entrances, stellar destinations are rarely quick to reveal themselves at first blush. But all things great—truly great—take some getting to. The Kelvingrove houses an apt exhibit of the first instance; the country in which it lives is the second. Glasgow acts as a stepping stone to the Hebrides, a western archipelago of Scottish islands anchored in the Atlantic. Accessible only by ferry and a handful of tiny airports, these isles take some getting to. Just as Glaswegians like to spar with their neighbouring metropolis, Edinburgh, by saying, “The only good thing to come out of Edinburgh is the train to Glasgow”, there are plenty of good things to come out of leaving Glasgow, too, not the least of which are the picturesque islands. I head west by car, passing the fresh waters of Loch Lomond, and onto a ferry. There are 790 isles dotting the waters off the mainland, and the Inner Hebrides are the closest to Glasgow. They consist of 79 distinct isles, 43 of which are uninhabited; of the former, the largest is Skye, at 1,656 square kilometres, whereas the smallest of the permanently inhabited islands is car-free Easdale—at just 0.21 square kilometres, its population sits around 60. On a typical Scottish day, the scene as you travel by passenger ferry through the islands in the North Channel of the Atlantic Ocean is all grey ocean and windy waters, at times bleak, and often dramatic. The cool climate appears in stark contrast to the islanders’ warmth, which magnifies Scotland’s prized mainland charm. Glasgow acts as a stepping stone to the Hebrides, a western archipelago of Scottish islands anchored in the Atlantic. Accessible only by ferry and a handful of tiny airports, these isles take some getting to. Perhaps as a result of the cold, or in spite of it, many artists have been inspired by Hebridean experiences. On Jura—which is a two-hour ferry ride from the mainland port of Kennacraig to Islay, followed by another 10-minute ferry ride—I can see why. The name itself is Old Norse for “deer island”, and it has a wild feel to it altogether, with its scant human population (it is home to about 190 residents) and an abundance of wildlife: thousands of red deer roam the hills, adders turn up in the grass, and seals play near the shores. There are wide open spaces that stretch to the ocean beyond. It is tranquil, with a bracing beauty. Jura is, to me, the crown jewel of the Inner Hebrides, the Dalí of this island cluster. 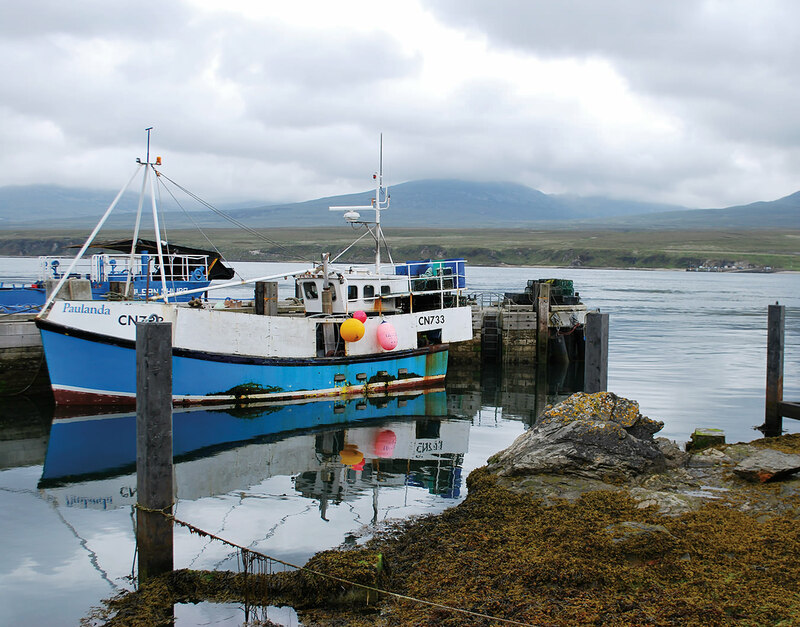 “Ungettable.” That is how Eric Arthur Blair—better known as George Orwell—once described Jura. The writer was introduced to the island in 1945 by newspaper publisher David Astor and became enamoured with its serene isolation, far removed from the bustle of post-war London. For two years, Orwell holed up in a Jura farmhouse, Barnhill, to finish writing his dystopian novel, 1984. Today, the Barnhill property is privately owned and the house often empty, but curious and Orwell-obsessed visitors can hike or drive from the main village of Craighouse along a rugged 35-kilometre track that passes by the home, or take boats and travel northeast along the coast to gaze at it from the water. I do the latter, and there are no off-shore buildings in sight for quite some time until Barnhill eventually looms above the waves. At first glance, it bears a striking resemblance to the hilltop house in Alfred Hitchcock’s Psycho. The winds aren’t blowing, the engine is cut, and the seals sulking on nearby rocks are silent. “The window at top left is to the bedroom where he usually wrote,” Campbell says. I’m with a group of seven, yet there is still an overwhelming sense of isolation. Times have changed, with a ferry network making Jura far easier to get to, but it remains remote. Orwell’s cottage is not the last stop on the island boat journey; I travel farther along the coast between Jura and the small neighbouring island of Scarba toward the Corryvreckan whirlpool—the third-largest whirlpool in the world. It exists because of the changing tides around a pyramid-shaped underwater mountain of basalt that reaches almost all the way up to the strait’s surface. Jura is also known for the Paps of Jura, a trio of distinctive mountains that break into the horizon. Geologists believe that, 400 million years ago, some of Scotland’s mountains were as high as the Himalayas. Today, some Scots make it their life’s mission to climb the 283 Munros (Scottish mountains with a height of over 915 metres) in their country; a few actually do it, and fewer still have done it twice. Those hardy climbers join local islanders and visitors for the annual Jura Fell Race, which sees flocks of runners and hikers trek through the foxgloves and fields and farms in May each year, reinforcing a sense of community but also taking advantage of Scotland’s “right to roam”. As per Scottish law, every citizen has the freedom to explore wherever they like, so long as they are respectful of the land and landowners. It’s a quaint notion, compared with the North American obsession with “No Trespassing!” anywhere, anytime. It’s also a reminder that the Scottish heritage is one of ramblers, strollers, wanderers, and takers of high and low roads alike. On their turf, I’m constantly compelled to strike out into the fields. “Ungettable.” That is how George Orwell once described Jura. For two years, he holed up in a Jura farmhouse, called Barnhill, to finish writing his dystopian novel, 1984. Accommodations on Jura are few and far between, but that’s all part of the charm. I take up residence in the Jura Lodge, a three-level building that is just steps away from the famous Jura whisky distillery. (British Prime Minister David Cameron has claimed that it’s his favourite dram of whisky, and he has visited the island on numerous occasions.) In a previous incarnation, the lodge was the former distillery manager’s, but today it has been refined and revamped with gusto by interior designer Bambi Sloan. Inspired by the idea of a worldly aunt who had completed the Grand Tour of Europe and returned with treasures of the world, Sloan designed it to be eccentric-chic, with antique fixtures, claw-footed bathtubs, and grand rooms bedecked with dozens of antlers, but the picture windows that look out upon Jura’s main harbour front get the most glances. The lodge can be rented through the distillery and Glasgow-based whisky production company Whyte & Mackay, and they also allow creative groups (such as writers and artists) to come for long stays. Barnhill was Orwell’s inspiration on Jura, and the Jura Lodge is mine. It’s even warm enough at night; on other islands, the heat is timed to kick in at 5 p.m. The ever-present cold must have helped fuel the Scottish love for whisky. After experiencing the whisky of Jura, I hop to the isle of Islay (pronounced “eye-la”; I was corrected by the Glasgow airport immigration officer), which is home to Bruichladdich, Laphroaig, Bowmore, and five other distilleries. I investigate Bowmore, which, founded in 1779, is the second-oldest distillery in all of Scotland. It’s also working toward becoming the greenest, with innovative energy recycling programs and a conscious reduction of landfill waste throughout the years. The buildings are whitewashed and utterly coastal, situated directly on the shoreline and constantly battered by salt winds. Visitors to Bowmore can opt for an interactive distillery visit, if they wish, which takes them from the mash house, where they can have a try at “turning the barley”, to the stills and the barrels, and, in the end, a sample of the final product. The entire island smells of what the islanders charmingly call “peat reek”. With two important needs taken care of—shelter and whisky—I turn my attention to food, and discover butter tablet. Most places have their own version of a sugar-butter sweet: South Americans struck gold with dulce de leche, for example, and Switzerland has mountainous Toblerone (not to mention the most-expensive-tasting bargain chocolate I’ve ever sampled). Scotland, and the islanders in particular, however, love a good piece of butter tablet. The name evokes density over delicacy, and that is entirely correct. Tablet is similar to fudge, but with the consistency of shortbread. I discover it folded into ice cream, cheesecake, and sold solo. Encapsulating a country in a candy is no easy feat, but tablet is just that to Scotland. Each of the Inner Hebrides has its own character, but a certain Scottish hardiness is a common thread. Likely as a result of being quite cut off from the mainland, islanders have a distinctively independent spirit. 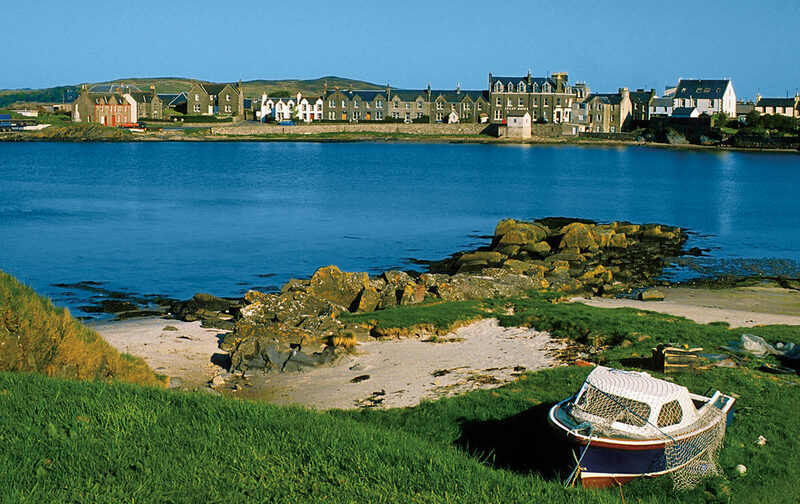 On the tiny Hebridean island of Gigha (pronounced “gee-ya”), independence stands strong. With its tiny population (about 150 people), it is storied among the isles as the little island that could. 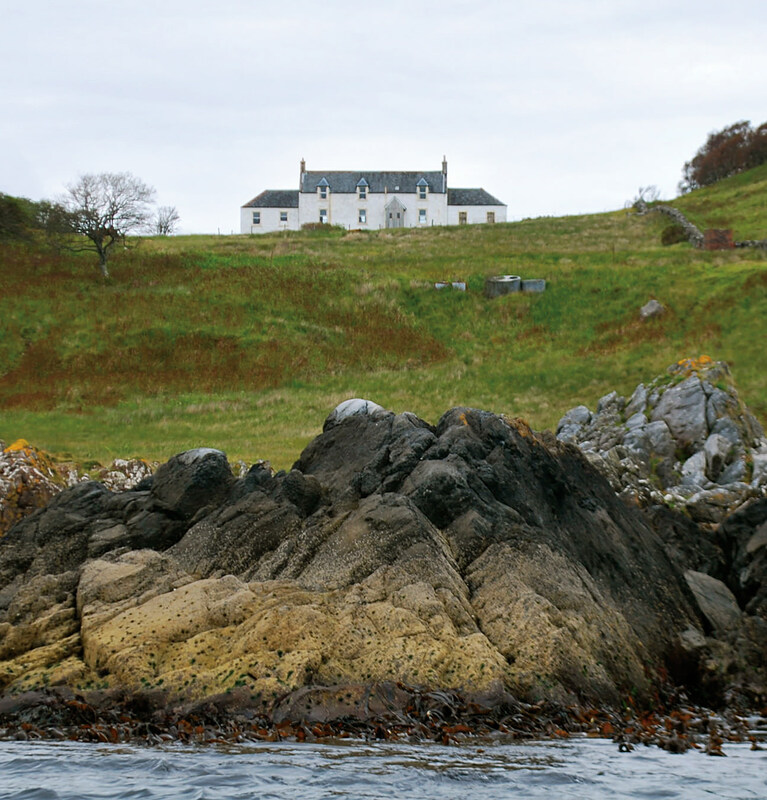 In 2002, Gigha’s inhabitants collectively bought out their landowners to become a community-owned island. The decision-making process was conducted in true Scots-style. “We sat down for some whisky and talked it through—then we said we should do it,” says Willie McSporran, a lifelong Gioghach and the former chair of Gigha’s heritage trust. Gale force winds blow by, and nearby majestic wind turbines—“the dancing girls”, as they’re called—produce the energy that powers the island economy. Times have changed since the days of Orwell, but the Inner Hebrides have mastered the art of preserving one’s character. “Ungettable”, no longer—worth seeking out, undoubtedly.